now i'm officially a nerd! !N.E.R.D!i haf eye infection lik forever to get better and u know la my power freaking high!somemore wear specs!officially become SEPET la! 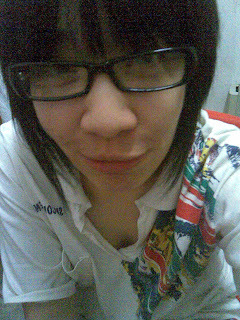 !chinese eye!hehehehe cute?newayz i dun lik wearing specs actually!i feel whenever i wear specs i look ugly! !i dunno y! 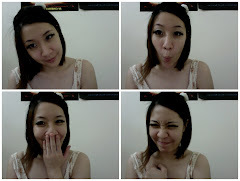 !i loose all my self-esteem therefore hardly anyone saw me wore specs but now hmp! !what to do?stupid eye! !i'm so gonna get laser when i got money! !i canot tahan get infection lik all the time! !no no no no no no no no!! !i bloody active right now not lik i'm sick but i am!!! !back to specs i still dun lik seeing myself wearing specs la ugly la!!!!!! !i dunno y! !some ppl look nice but i dun look nice wearing specs therefore i hope my eye get well and get rid of the specs plus i got braces! !lik super duper NERDY!!!!!!!!!!! !